My mama is always running around now. I shout after her a lot because I can’t crawl properly yet, never mind run. Everything was the same for ages, then we went on our holidays then I started going to that creche place. Then I stayed in Oma & Opa’s house when mama & dada went to their friends wedding and then we’ve been home again the last few nights. I’m meeting so many new people, the nice ladies that mind me but aren’t my mama, and the other babies that I play with in the creche. I wonder where I’m going tomorrow? Mama says “Dom! Give me your handie! Handie!” lots. Sometimes I give her my handie for the spoon of food and sometimes I don’t. 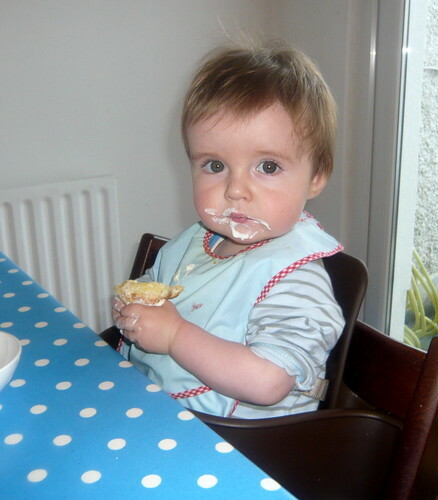 The ladies in the creche don’t have time for how long it takes me to eat so they just put the food in my mouth. I’m very tired in the evening so it’s easier to just open my mouth and let mama or dada put the food in. Then this weekend I’d more energy. Not my usual amount of energy though – I have a cough & I’m not sleeping too well because of that. Today me and mama and dada made a super special effort and I had 3 meals to eat only with my handies. For breakfast we had dada’s Swedish friend Erik’s American wife Amy’s pancakes. They have a little girl I want to meet but we have to wait til mama’s work let her take enough days off for us all to go to Sweden where they live. I don’t know where that is, but I hope they have duckies there. I’ve had pancakes before, but I think I like these better because of the yogurt and banana in it. We ate them with greek yogurt & grapes. Mama and dada had maple syrup too but said I couldn’t have any. Don’t mind they were sweet and fluffy, and I like that. Whisk together all ingredients and drop by 1/4 cupfull into med-hot frying pan, greased with vegetable oil. Flip when cakes begin to bubble. Flip again after 30 seconds or so, but don’t flatten with spatula. Keep in a warm oven until all batter is used up. I usually end up with around 12 (give or take a cake) 3-inch pancakes. For lunch, I had cheese and chicken and cherry tomato. I had my chicken on brown bread with butter and I nommed it up. Dada decided it was time for me to have meat again. Mama doesn’t mind so much because now dada has to take charge of cooking for me for a couple of days to use up the whole chicky in the fridge. Then for my dinner Dada made a very speedy chicken & couscous recipe from the Annabel Karmel book. He put in some lovely creme fraiche to make it stickier for me to pick up. I got it in my mouth and everywhere else. Mama says she’s not sure why she bothered washing the floor and my chair this morning at all at all. < give me strength to carry on! the cough has only really started. he threw up once at the weekend with his grandparents, and once today in the creche because of it. I don’t think it’s that he was coughing really hard or anything – but he was quite phlegmy because of it, and there’s lots of saliva from teething and it was all just too much after a bottle. he’s quite unsettled at night with the cough too. you must be an expert at all the ailments, thought you might have the wonder solutions for me! have you had to keep Rían at home many days? Does one of you just take a sick day or a holiday day? This is a lovely way of doing the blog. Am going to try those pancakes later, they sound delicious. I’m glad you liked the pancakes. My parents wouldn’t let me have syrup for ages, then I started to notice that their pancakes looked stickier than mine (I love sticky!) and I asked for some of the brown stuff. My mom is so boring, she only gave me the tiniest drop. It was gooooood. Hey – I’ve had to take 1.5 days off so far and Rodi’s Mum took a day off work and came to look after Rían one day when he was ill. There’s a law that every employee (men and women) gets 3 days of Force Majuere Leave per year. This is paid leave if you have to leave work urgently to look after a sick member of your family so that’s what I’ve used so far 🙂 Get yours in before the year is out, lol. Helen, I thought it might be a bit dry if it was just me going ‘he ate this, and he didn’t eat this’ etc! Glad you like it. Siggy I think it won’t be long til we’re giving baby Dominic some little treats. He’s very interested in what we’re having that he’s not now!